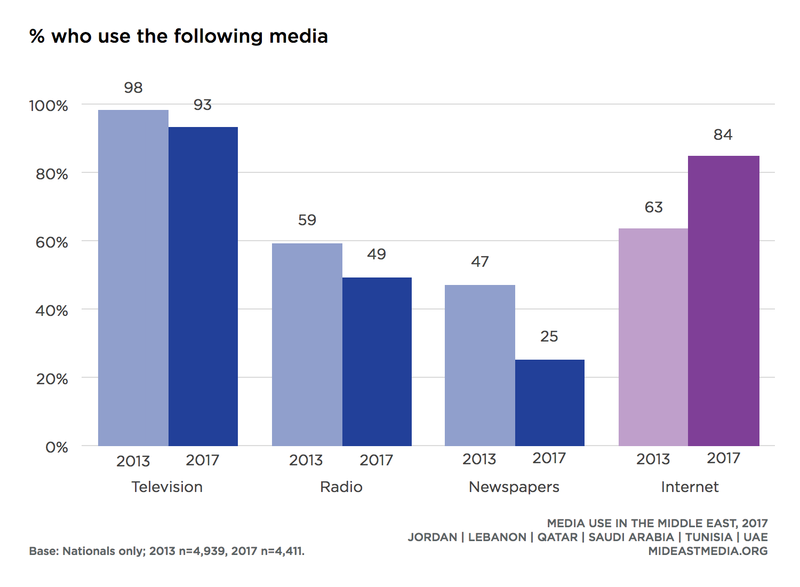 Over the past five years, 2013 to 2017, internet penetration rose in all six countries surveyed, and most dramatically in Jordan, Lebanon, and Tunisia (Jordan: 33 percentage point increase, Lebanon: 33-point increase, Tunisia: 24-point increase). Even with this increase over time, internet penetration is comparatively low in Tunisia (68%), while more than nine in 10 nationals use the internet in Lebanon, Qatar, Saudi Arabia, and the UAE. The youngest nationals (18-24) report close to 100% penetration, while the oldest nationals (45+) continue to lag far behind on internet use. Internet use is growing quickly among the middle age groups. In fact, 35 to 44 year-olds report a 36 percentage point increase in internet use from 2013 to 2017 (18-24 year-olds: 86% in 2013 vs. 96% in 2017; 25-34 year-olds: 77% vs. 94%; 35-44 year-olds: 52% vs. 88%; 45+ year-olds: 28% vs. 55%). Internet penetration increases sharply with education, but it is the second least-educated group—those with an intermediate education—that saw the largest increase in internet use from 2013 to 2017, 39 percentage points (primary school or less: 13% in 2013 vs. 31% in 2017; intermediate: 38% vs. 77%; secondary: 71% vs. 91%; university or higher: 87% vs. 97%). Smartphone ownership tracks closely with internet use in the six surveyed countries. 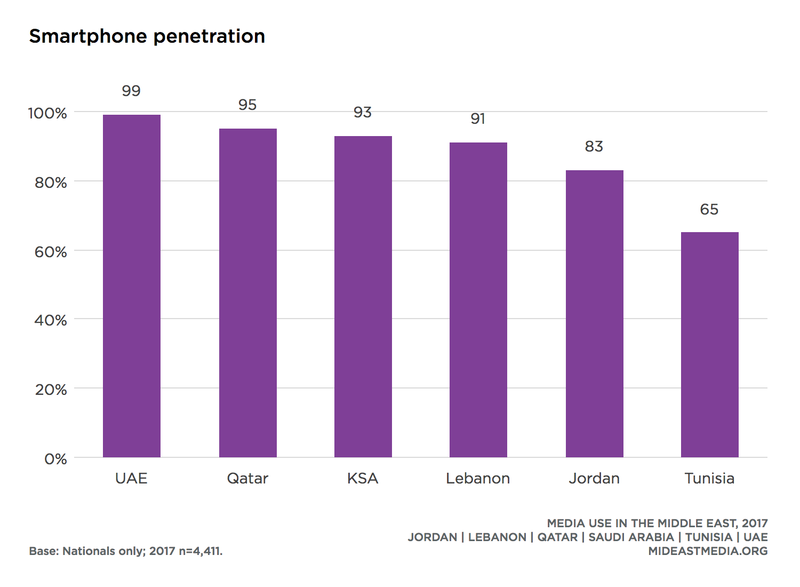 Nearly all nationals in Lebanon, Qatar, Saudi Arabia, and the UAE own a smartphone—nine in 10 or more—compared with 83% of Jordanians and 65% of Tunisians. Smartphone use has increased substantially in all countries since 2013, but most notably in Jordan, Tunisia, and Lebanon (Jordan: 49 percentage point increase, Tunisia: 40-point increase, Lebanon: 38-point increase). Smartphone ownership is fairly consistent among nationals under the age of 45 but much lower among those at least 45 years old (95% 18-24 year-olds, 94% 25-34 year-olds, 89% 35-44 year-olds, 58% 45+ year-olds). Smartphone ownership also increases with education. Only one-third of those with a primary school education own a smartphone compared with nearly all university-educated nationals (31% primary or less vs. 97% university or higher). As internet penetration rises, nationals are less likely to be using offline media platforms compared with 2013. Most nationals still watch TV, but the rate has declined modestly since 2013 (98% in 2013 vs. 93% in 2017). Rates of newspaper readership, however, declined more sharply from 47% in 2013 to 25% in 2017. Radio and magazines have also become less popular in the past five years (radio: 59% in 2013 vs. 49% in 2017; magazines: 26% in 2013 vs. 19% in 2017). The youngest cohort (18-24) uses media differently than nationals 25 years and older who are generally similar in their media use. The youngest nationals are the most likely to read books but the least likely to listen to radio or read newspapers (books: 40% 18-24 year-olds vs. 28% 25-34 year-olds, 24% 35-44 year-olds, 20% 45+ year olds; radio: 41% vs. 50%, 54%, 51%, respectively; newspapers: 19% vs. 28%, 28%, 27%, respectively). At least nine in 10 nationals across all age groups watch TV. Media use increases with education for all platforms except TV, which is watched by almost all nationals regardless of education level. 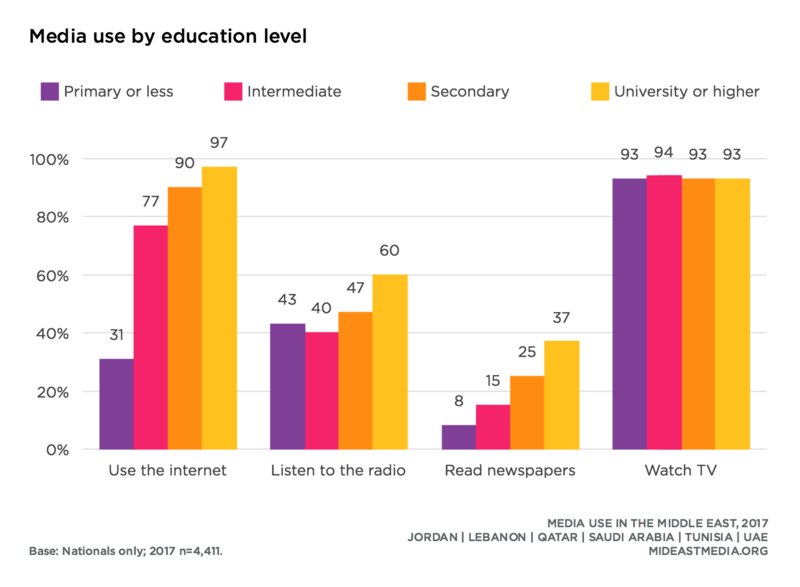 Compared to those with a primary school education, university-educated nationals are more likely to engage with all media: 43% primary school vs. 60% university-educated listen to the radio, 6% vs. 42% read books, 8% vs. 37% read newspapers, and 4% vs. 25% read magazines. Nationals across all countries spend the greatest portion of their time online—an average of 29 hours per week—compared to 19 hours per week watching TV. The largest difference in hours spent online per week compared to watching TV is in Qatar and the smallest gap is in Tunisia (Qatar: 45 hours online vs. 15 hours watching TV; Tunisia: 25 hours online vs. 20 hours watching TV). Interestingly, the amount of time internet users spend online per week has not changed since 2013 (28 hours in 2013 vs. 29 hours in 2017). The number of hours spent watching TV per week declined somewhat from 22 hours in 2013 to 19 hours in 2017. There are clear distinctions between younger and older nationals in the time they spend consuming media. The number of hours spent online each week decreases with age, while time spent watching TV increases with age. Each week, younger nationals (18-24) are online for an average of 34 hours and spend 18 hours watching TV. In contrast, nationals 45 years and older watch an average of 23 hours of TV each week and are online for 19 hours. Nationals with the least education (primary school or less) spend an average of 23 hours per week watching TV and 19 hours online. In comparison, university-educated nationals watch an average of 17 hours of TV each week and spend 30 hours online. Percentage change in Tunisia is from 2014 to 2017. Arab nationals spend nearly twice as much time socializing with family as they do with friends. In an average week, nationals spend about 41 hours socializing with family face-to-face or online, compared with 24 hours socializing with friends. Most of the socializing with family is face-to-face. On average, nationals spend 33 hours per week socializing with family in person and another eight hours socializing online. Time spent socializing with friends, on the other hand, is evenly split between face-to-face and online (13 hours face-to-face and.10 hours online). Nationals are more likely to spend their time online socializing with friends than with family. The one exception is the UAE, where Emiratis socialize online with family for an average of 17 hours per week compared with 12 hours online with friends. 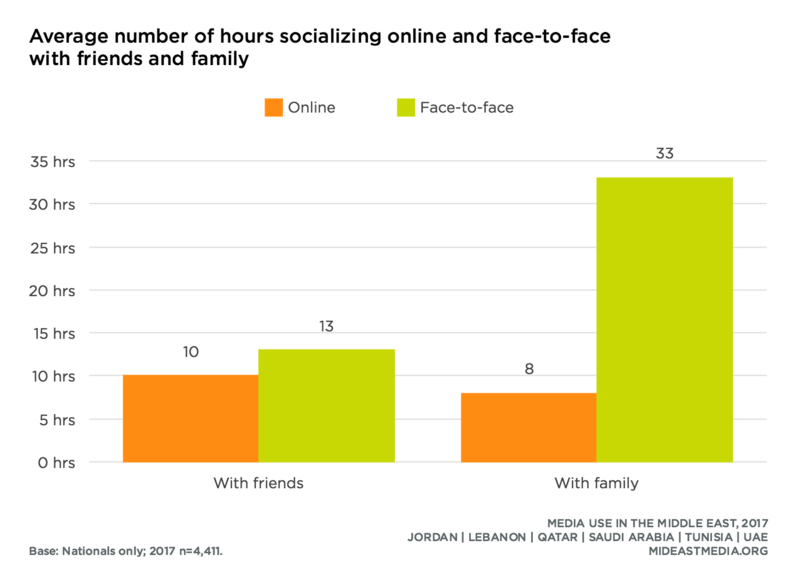 Interestingly, while Qataris spend nearly three times as many hours face-to-face with family as they do with friends, they are twice as likely to socialize with friends as family online (face-to-face: 43 hours family vs. 13 hours friends; online: 14 hours friends vs. 7 hours family). As might be expected, single men and women spend more time socializing with friends than married respondents, while married men and women spend more time with family than their single counterparts. 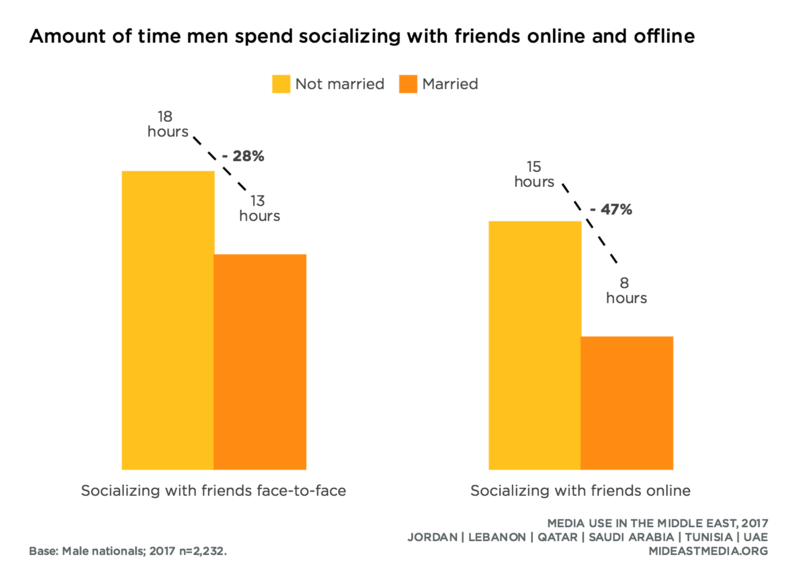 Compared to married men, single men spend five more hours per week socializing with friends in person and eight more hours per week socializing with friends online. Compared with married women, single women spend five more hours socializing with friends in person and seven more hours socializing with friends online. Married men, on the other hand, spend nine more hours per week socializing face-to-face with family than single men. Married women spend six more hours per week with family compared with their single counterparts. The way nationals socialize with friends changes with age. The youngest group (18-24) spends as much time every week socializing with friends online as face-to-face (16 hours online vs. 16 hours face-to-face). In comparison, the oldest age group (45+ year-olds) spends twice as much time socializing with friends face-to-face as online (11 hours face-to-face vs. 5 hours online). All age groups spend at least three times as much time socializing with family face-to-face vs. online, and for the oldest age group the difference between socializing face-to-face and online is sixfold (36 hours face-to-face vs. 6 hours online). 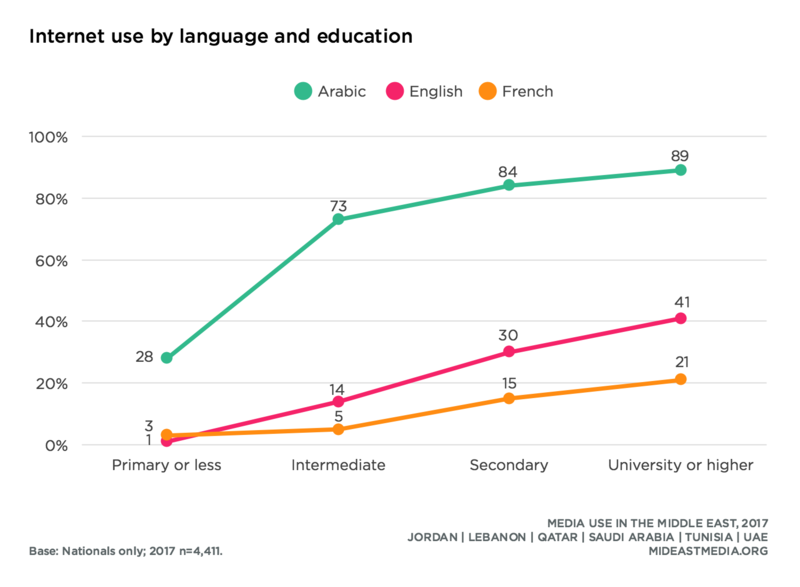 Nearly all Arab nationals access all media—internet, TV, radio, and newspapers—in Arabic, while use of English varies by medium. English is most often used when accessing the internet, followed by TV (28% internet, 17% TV). Far fewer nationals listen to the radio or read newspapers in English (4% radio, 2% newspapers). Lebanese, Qataris, and Emiratis are most likely to use the internet and watch TV in English (internet: 56% Lebanon, 49% Qatar, 33% UAE; TV: 34% Lebanon, 26% Qatar, 37% UAE). Tunisians and Lebanese also use media in French. Tunisians are more likely to use media in French than in English (TV: 27% French vs. 10% English; internet: 43% French vs. 13% English). 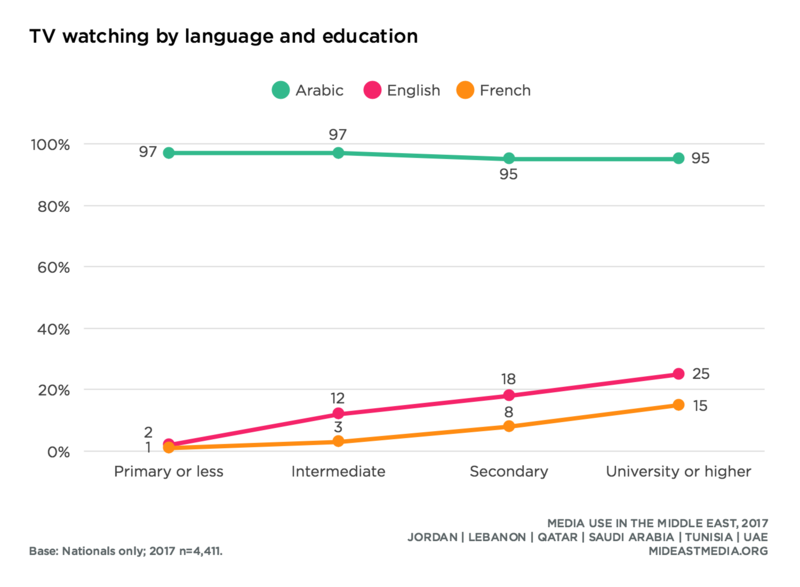 By contrast, Lebanese nationals are less likely to access both TV and the internet in French than in English (TV: 11% French vs. 34% English; internet: 17% French vs. 56% English). 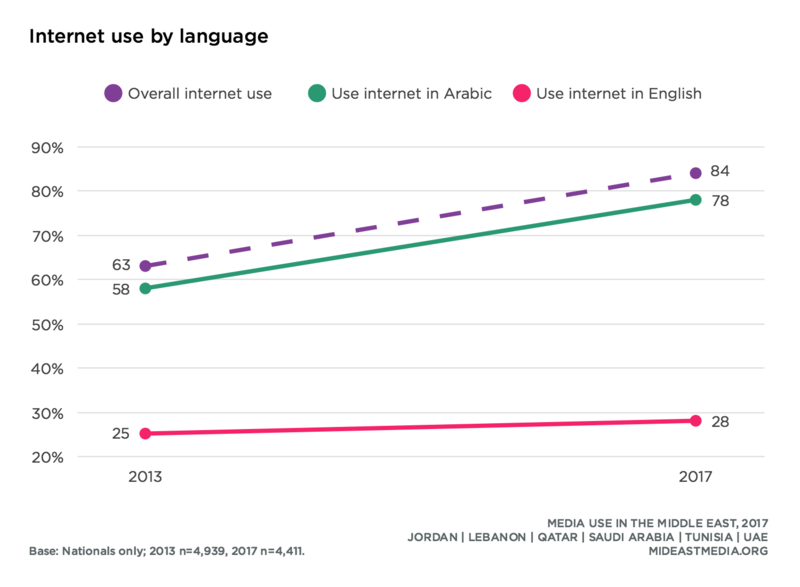 Use of Arabic online has increased proportionally with the increase in internet use over time. Sixty-three percent of nationals used the internet in 2013 compared with 84% in 2017 (a 21 percentage point increase). Fifty-eight percent used the internet in Arabic in 2013, a figure that reached 78% in 2017 (a 20-point increase). In comparison, use of the internet in English remains essentially flat, 25% in 2013 and 28% in 2017, despite the increase in internet use. Age plays a role in which languages are used to access media. While almost all nationals across age groups watch TV in Arabic, watching TV in English decreases with age (24% 18-24 year-olds, 20% 25-34 year-olds,16% 35-44 year-olds, 7% 45+ year-olds). Similarly, while using the internet in Arabic is high for all age groups (except those 45 years and older who are less likely to use the internet at all), use in English decreases significantly with age (Arabic: 88% 18-24 year-olds, 87% 25-34 year-olds, 83% 35-44 year-olds, 52% 45+ year-olds; English: 41%, 33%, 23%, 12%, respectively). Languages used to access media also vary with education. Education is not a factor with regard to watching TV in Arabic, but English TV viewership increases with education (2% primary or less, 12% intermediate, 18% secondary, 25% university or higher). Use of the internet in Arabic follows the same pattern as overall internet use with a large jump between the primary and intermediate educational levels, whereas using the internet in English increases more gradually with education (Arabic: 28% primary or less, 73% intermediate, 84% secondary, 89% university or higher; English: 1%, 14%, 30%, 41%, respectively). Playing sports or exercising is part of the weekly routine for nearly four in 10 nationals across the region (38%). Half or more nationals in the Gulf states and fewer in Jordan, Lebanon, and Tunisia, play sports or exercise in a typical week (60% Qatar, 54% UAE, 49% KSA vs. 24% Jordan, 35% Tunisia, 38% Lebanon). 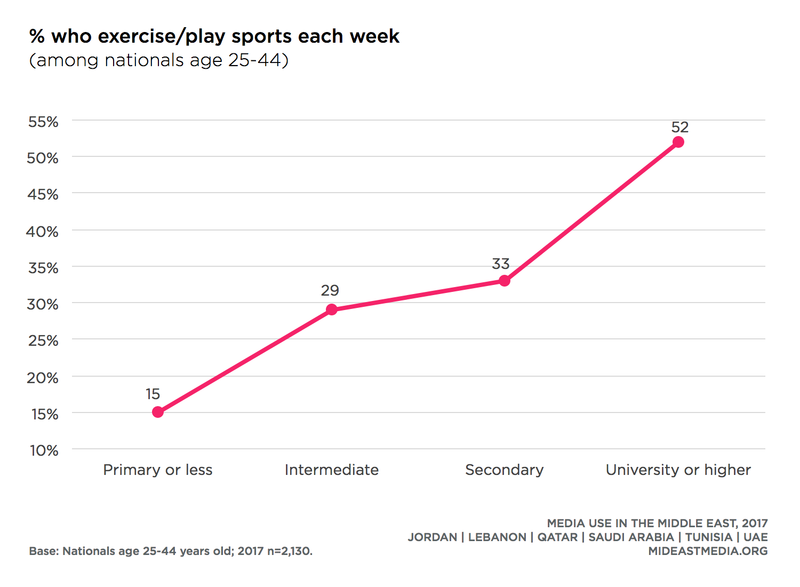 On average, nationals exercise or play sports 6.5 hours per week—about one hour a day (7.5 hours KSA, 7.3 hours Jordan, 6.3 hours Qatar, 6.3 hours Tunisia, 5.8 hours UAE, 5.6 hours Lebanon). Weekly physical activity is less popular than watching TV or listening to the radio weekly but is a more common activity than reading books, newspapers, or magazines (38% exercising/playing sports vs. 93% TV, 49% radio vs. 29% books, 25% newspapers, 19% magazines). Exercising and playing sports are associated with a more general interest in viewing sports. Half of nationals who watch sports on TV or online exercise or play sports themselves, compared to only about three in 10 who exercise but do not watch sports (exercise/play sports: 52% who watch on TV vs. 31% who do not watch on TV; 54% who watch online vs. 27% who do not watch online). Men are more likely than women to exercise or play sports—by 19 percentage points. Yet among those who do participate, both men and women invest somewhat similar amounts of time on exercise or sports (participate: 48% men vs. 29% women; hours per week: 7.1 hours men vs. 5.5 hours women). Not surprisingly, exercise and sports participation rates are highest among the youngest age groups and decrease sharply with age (56% 18-24 year-olds, 45% 25-34 year-olds, 32% 35-44 year-olds, 18% 45+ year-olds). The number of hours spent exercising or playing sports per week, however, is fairly similar across age groups among those who participate, with less than two hours difference across age groups (7.1 hours 18-24 year-olds, 6.7 hours 25-34 year-olds, 5.3 hours 34-44 year-olds, 5.6 hours 45+ year-olds). Participation in sports and exercise increases steadily with education with university-educated nationals five times more likely than those with a primary education to exercise or play sports (10% primary or less, 24% intermediary, 41% secondary, 51% university or higher). Those with a primary education who exercise do so two hours less per week than nationals with more education. Four in 10 nationals watch sports on TV and nearly half of internet users watch sports online. While watching sports on TV remained stable since 2013, more internet users now watch sports online (TV: 41% in 2017 vs. 43% in 2013; online: 47% in 2017 vs. 32% in 2013). Saudis and Emiratis watch sports on TV at higher rates than other nationals (55% KSA, 52% UAE vs. 44% Tunisia, 39% Lebanon, 36% Qatar, 29% Jordan). 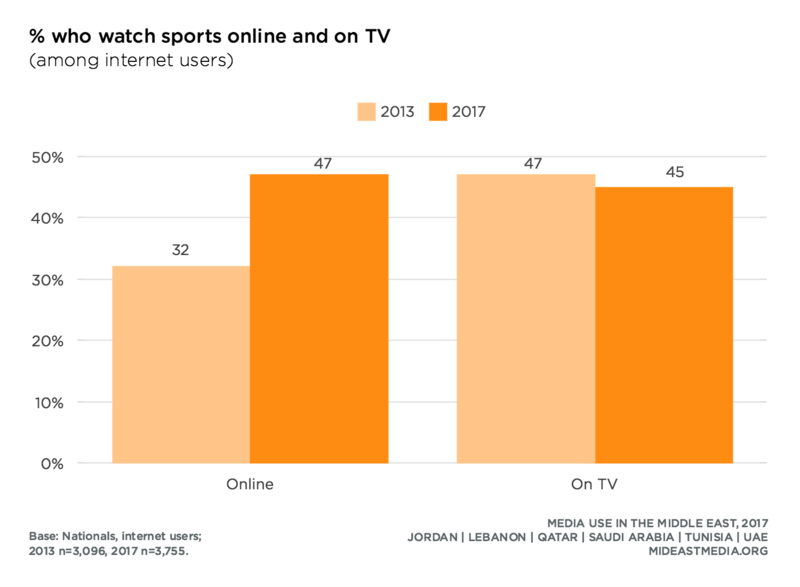 Lebanese and Jordanians are less likely than other nationals who use the internet to watch sports online (36% Lebanon, 38% Jordan vs. 60% KSA, 56% Qatar, 55% Tunisia, 51% UAE). 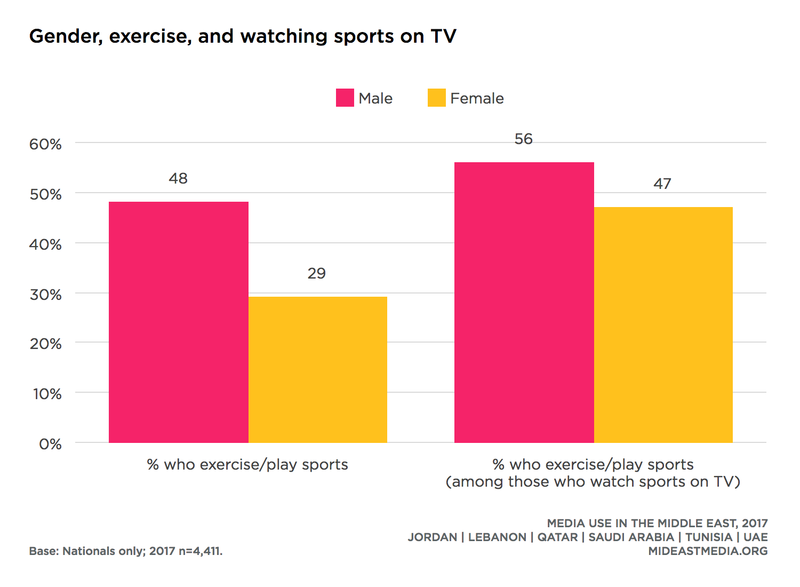 Patterns for watching sports are similar to those for playing sports, with younger, male, and more highly-educated nationals expressing broader interest in sports programming. Among internet users, men are three times more likely than women to watch sports, both on TV and online (TV: 65% men vs. 18% women; online: 70% men vs. 23% women). Sports viewership decreases with age and increases with education. Nationals under 45 years old watch sports at a significantly higher rate than those 45 years and older (TV: 48% 18-24 year-olds, 47% 25-34 year-olds, 40% 35-44 year-olds, 29% 45+ year-olds; online among internet users: 54%, 51%, 43%, 32%, respectively). Sports viewership on TV and online increases incrementally with education (TV: 23% primary or less, 35% intermediate, 44% secondary, 48% university or higher; online among internet users: 28%, 33%, 49%, 53%, respectively). Three in 10 internet users have posted, shared, or commented on sports online in the past month, similar to rates for music and news and higher than postings about TV, films, or fashion (31% sports, 34% music, 36% news vs. 23% TV, 23% films, 22% fashion). 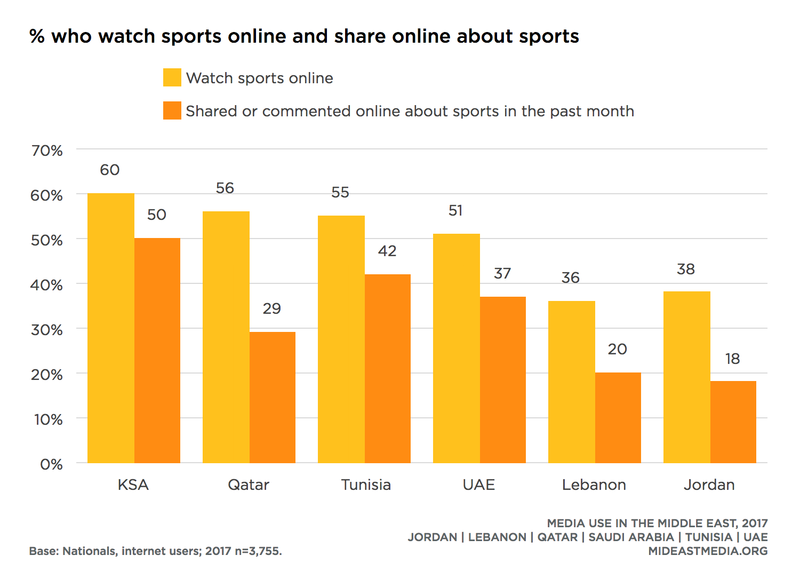 Posting about sports online is most widespread among Saudi and Tunisian internet users and least common among Lebanese and Jordanian internet users (50% KSA, 42% Tunisia, 37% UAE, 29% Qatar, 20% Lebanon, 18% Jordan). As with watching sports, men are more than three times as likely as women to have posted about sports online in the past month (48% men vs. 13% women, among internet users). The oldest and least educated internet users are least likely to post or share about sports online. Four in 10 of the youngest group and only two in 10 of the oldest group have posted about sports online in the past month (38% 18-24 year-olds, 33% 25-34 year-olds, 26% 35-44 year-olds, 20% 45+ year-olds, among internet users). The most highly educated internet users are twice as likely as the least educated group of internet users to post about sports online (16% primary or less, 19% intermediate, 33% secondary, 35% university or higher, among internet users). Two-thirds of nationals follow news about sports and three in 10 do so every day (67% at all, 30% every day). 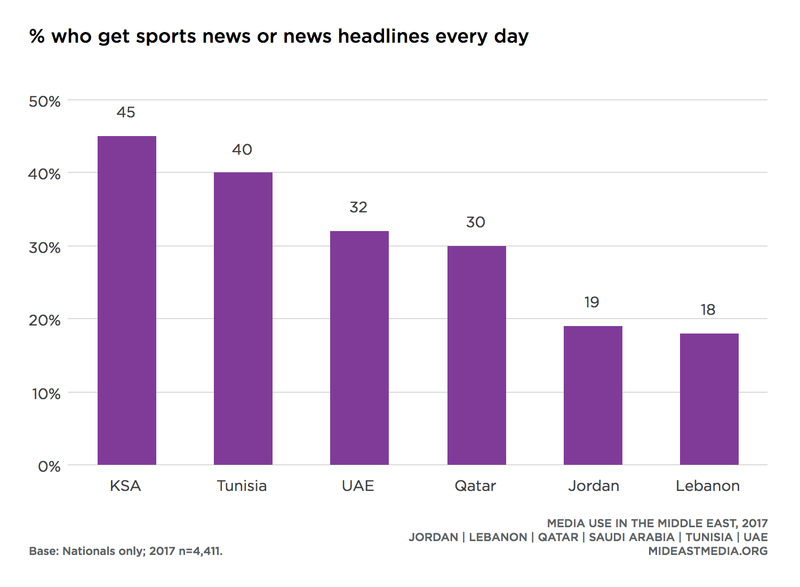 Saudis and Tunisians are the most likely to follow sports news on a daily basis, Jordanians and Lebanese less so (45% KSA, 40% Tunisia, 32% UAE, 30% Qatar, 19% Jordan, 18% Lebanon). Men are three times more likely than women to check sports news on a daily basis (46% men vs. 13% women). Interest in sports news also decreases with age, with the youngest group twice as likely as the oldest to check sports news daily (38% 18-24 year-olds, 35% 25-34 year-olds, 26% 35-44 year-olds, 17% 45+ year-olds). Similarly, highly educated nationals check sports news daily at double the rate of their least educated counterparts (16% primary or less, 21% intermediate, 32% secondary, 35% university or higher).